Shiloh. In Hebrew it means 'place of peace'. An apt name for a tiny Methodist chapel close to the banks of the Tennessee river. It has borne witness to christenings, weddings, and funerals. Its parishioners are thankful for their peace. Peace, that is, until Grant's Union army arrives to take up every available space in and around the church and on all of the community's farm land. Within his camps are soldiers that are simple, scared, green, boastful, veteran, and foolish, all hoping that they do not shirk their sworn oaths. They are full of hope that soon they will sally forth and give battle to their enemy, thirty four miles away. Battle is less than a few miles away as another army of green and untried soldiers is marching, stealing up upon the Union army's encampment with the Tennessee river at its back and no hope of immediate reinforcement. These Confederates are full of hope too, hope that they will not shrink from their oaths when the fire is the most intense and their friends are falling left and right. Battles are planned by the generals, but they are fought by the soldiers; the simple, the scared, the green, the boastful, the veteran, and the foolish. They Met at Shiloh is a civil war historical novel. In the tradition of Michael Shaara's The Killer Angels and All Quiet on the Western Front, you'll smell the powder and suffer the anguish of loss and understand why soldiers above all else prefer peace to war. Grab the first and penultimate start to a journey through the American Civil War in the western theater and experience the war from the ranks as a soldier. Phillip M. Bryant attended the University of New Mexico and earned his bachelor's degree in history and with a minor in American studies. He has been active in local New Mexico reenacting and on the national level is a member of the 23rd SNY as part of the Army of the Pacific, 1st Federal Division. He has been researching the American Civil War for over 25 years. His sources have included diary accounts, autobiographies, historical monographs and first-hand reports on the actions taken 150 ago published in the War of the Rebellion battle reports and War Department communications. Phillip served 15 years in the Army, New Mexico National Guard, with the 44th Army Band in Albuquerque, New Mexico. 'They Met at Shiloh' follows four men across the battlefield of Shiloh during the American Civil War. Each man must fight not only the battle set before him, but internal wars as well. To the interested reader, to the person who wants to know more about Shiloh and the cog this battle fit in the larger scheme, this book may be helpful. Even more valuable, if someone asks 'what was it like to be a soldier in the western theatre of the Civil War,' 'They Met at Shiloh' is highly recommended. To the average reader, this novel may feel somewhat sluggish, especially at the beginning. Bryant brings to life the soldiers who fought for a variety of reasons, risking their lives for their 'pards' and their country. Well researched, well thought out, and well worth the money. I thoroughly enjoyed Phillip Bryant's book, They Met at Shiloh. The Civil War novels I have read before were primarily from the view of the officers, especially the generals, but this historical fiction was written from the viewpoint of the privates and sergeants, the men on the front lines. The men who were being targeted with the cannons and rifle fire had a different perspective from those who were planning the strategies. They wondered why they were there, why they were fighting their fellow countrymen. Mr. Bryant did an excellent job of expressing their conversations and thoughts. He also gave perspective on their lives in the military...the hours of boredom, moments of fear and terror, and even moments of heroism, which men on the front lines would probably all experience. Another thing I appreciated about this book was that both sides, the Union and the Confederacy, were equally represented and neither side condemned. The book seems to be well researched and contains many details about day to day camp life that were fascinating to me. I look forward to more from Mr. Bryant. I cannot write a review that gives this book justice because I am not nearly talented as the author. I knew about Shiloh and the death it poured down on both sides. However, this book, and the authors remarkable skill gave me even a better understanding of what Shiloh was really like. I heard the mini balls whistling by my head, saw the artillery shells bouncing across the ground, the holes grape shot made in advancing lines, and I felt the shrapnel falling out of the sky from an exploding shell. I could smell the fresh blood, decaying corpses (both men and animals), and the throes and sounds of dying humanity. All this occurred as we stood both with the Confederate and Union Armies. To accomplish all this, the author had a rich and full set of men on both sides. After reading this book, I am even surer that war has no other goal than destroying humanity. I feel sorry for anyone that feels differently. Inclosing I would like to point out that there was a part of the story that was close to my heart. The character Phillip, in the Union Army, was a minister that lost his way and abandons his calling. In this book he found his way back to his calling when he reluctantly ministered to the broken remnants of both sides as they lay wounded and dying. Do not miss reading this book. 4/3/1862, Polk’s Battery East Corinth Rd. Captain Michael Grierson (son/brother, narrator, 5th. Texas Artillery, Tennessee Battery), Private Robert Mitchell, Private Stephen Murdoch & William Banks growing up in that time era help narrate the story as to how/why the United States Civil War began/ended. Pittsburg Landing, TN. 4/6-7/1862, Battle of Shiloh. Was fought between General Albert Sidney Johnston (Confederate) & General Ulysses S. Grant (Union). As a retired US Army Vietnam vet, & history as 1 of my many undergrads, I love reading about war. Enough graphic detail about the Civil War has been lost, never told or buried from the past. I did not receive any type of compensation for reading & reviewing this book. While I receive free books from publishers & authors, I am under no obligation to write a positive review, only an honest one. All thoughts & opinions are entirely my own. A very awesome book cover, great font & writing style. A very well written historical fiction book. It was very easy for me to read/follow from start/finish & never a dull moment. There were no grammar/typo errors, nor any repetitive or out of line sequence sentences. Lots of exciting scenarios, with several twists/turns & a great set of unique characters to keep track of. This could also make another great Civil War movie, or better yet a mini TV series. A little hard to follow at times but I will still rate it at 5 stars. I really hate when folks say “it’s chick lit” or some such rot. Good books cross gender lines. However, when I started Bryant’s book, I really struggled to get into it, and immediately thought it was a “guys” read. Thankfully, I kept reading. 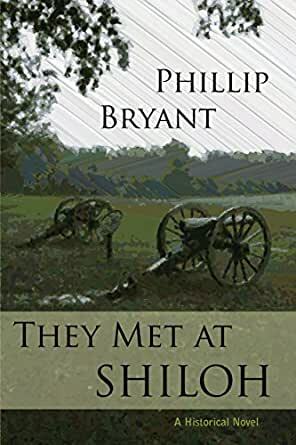 They Met At Shiloh isn’t what I’d call a gripping read, but ever so slowly you begin to feel for the soldiers Bryant’s created. From the former preacher who left the pulpit after refusing to sugar coat a sinner’s death to the young, mentally challenged German immigrant who proves to be braver than his parts. The first in Bryant’s Shiloh Series, They Met At Shiloh is more than historical fiction, more than vivid reimagining of battle scenes. It is a tale of forgiveness, humility, and redemption, and how those things are often found in the most unlikely of places. I started this book impatiently anticipating its end. I finished it adding the rest of the series to my ‘want to read’ shelf.